The latest and up to date version of MTK Droid Tools has been released with more remarkable features and free downloading link of latest exe file is now available in this website to free download. You can download this easy and simple tool without paying any money from here. Now you can download and install MTK Droid Tools for windows or PC for free from link below. 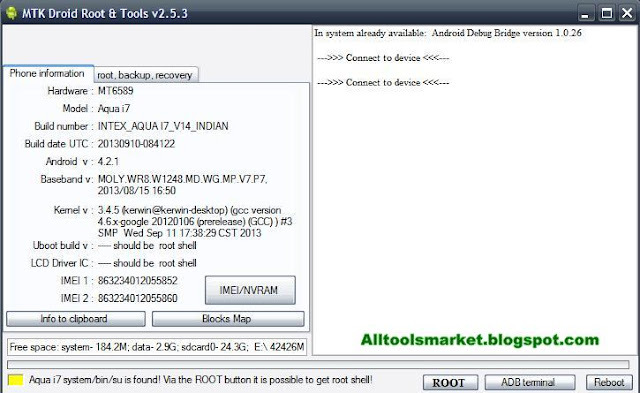 MTK Droid Tool is a tiny tool, which helps to root your Android phone or tablet, backup recovery, backup stock firmware/flash files, create scatter files, write IMEI and many other works easily. It is especially designed for MTK (MediaTek) Android devices. By using this, you can perform all above activities and it can support all current MetiaTek chipsets like MT6575, MT6572, MT6577, MT6589T, MT6592, and MT6582. Remember that, it only works on Android devices and not for all other devices. MTK Droid Tools is one the best and working tool, it let you to perform a variety of activities on your Android Smartphone. So, what you are waiting for? Get the latest version of MTK Droid Tool for your PC from provided download link and backup stock flash files, root, flash and write IMEI on your Android MediaTek (MTK) devices very easily. Restore and backup IMEI on any MTK Android Smartphone. Only one click to root your Android phone or tablet. It simply creates scatter files and flash any MTK device. It can backup any MTK phones stock firmware or flash file. It backup stock recovery and restore recovery on any MTK device. Make sure that, MTK Droid Tools APK file is currently not available in APK format. Use this tool on your windows system and enjoy its free functions. Here we have provided the latest version of MTK Droid Tools for PC at here. Download it right now.